An auditing process at Sydney/Sydney Eye Hospital revealed that patients are not as involved as they could be during the routine bedside handover processes that occur between nursing shifts. A project was established to address this, and in doing so, improve the safety and satisfaction of the patient. This program evaluates and re-invents St Vincent's Hospital’s weekly rapid discharge rounds model. This is carried out by introducing ward-level clinical leads and creating better documentation around discharge plans. The goal is to improve safe and timely patient discharges. Nepean Hospital established an Obstetric Pre-anaesthetic Assessment Clinic for high-risk obstetric patients and those undergoing an elective caesarean section. Anaesthetists at the clinic assess the patient and explain anaesthetic procedures in a way that allows patients to give informed consent. Liverpool Hospital is implementing a home-based subcutaneous immunoglobulin replacement therapy program for patients with impaired immune systems. Sydney Children’s Hospital Randwick developed an integrated model of care for children with non-complex asthma, including care coordination, communication with general practitioners, parent education and emergency department resources and processes. NSW Ambulance introduced a falls package to address the year-round problem of falls in people aged 65 and over in the community. It incorporated a new falls risk assessment, protocol, clinical pathway and screening tool for paramedics, as well as education materials for consumers and general practitioners. Prince of Wales Hospital screened all patients booked for elective cardiac surgery, to diagnose diabetes and identify those requiring blood glucose level control before admission. Royal North Shore Hospital is developing a clinical pathway for people who frequently present to hospital emergency departments with chronic pain and complex conditions, which will be rolled out across the state following evaluation of the pilot program. St George Drug and Alcohol Service established a clear process for blood-borne virus screening, by delivering training to staff and embedding the test into the initial assessment of new clients. Prince of Wales Hospital implemented a cost-saving strategy in the cardiothoracic intensive care unit, incorporating ordering and procurement practices, storage management and intra-hospital stock rotation. Nepean Hospital provided patients in a trial ward with a template containing prompts, so they could deliver a handover of their healthcare journey once a day to nursing staff. SESLHD trained dental professionals to help clients quit smoking and implemented a number of solutions to increase accountability and knowledge in this area. Sutherland Hospital Mental Health Rehabilitation Unit implemented new policies and processes for managing admissions, then educated staff on the changes. Hunter New England Mental Health implemented a new screening tool and staff education to ensure patients with delirium are provided with the right care pathway. Mid North Coast Local Health District (MNCLHD) centralised requests for expert witness certificates (EWCs) and developed a new review process in collaboration with staff and NSW Police. This project improved care delivered to people with eating disorders in Broken Hill and surrounding areas in FWLHD. It focused on increasing clinicians’ skill and confidence by providing education sessions, improving access to resources and increasing opportunities for professional networking. MLHD identified an alternative option for iron replacement therapy and developed guidelines to deliver it in the community setting where clinically indicated, in collaboration with patients and carers. Belmont Hospital introduced a 24-hour escalation plan and daily emergency report, to help emergency department staff manage periods of high demand, without reducing the quality or timeliness of patient care. The Heart and Lung Clinic at St Vincent’s Hospital Sydney implemented a number of changes to the way it follows up and communicates external pathology results. This included the development of a new standard operating procedure, a dedicated area for reviewing patient files, new staff rosters, patient information brochures, patient database updates and standardised communication tools. Blacktown Hospital educated administration staff on the importance of maintaining accurate contact details in patient records. It also displayed signage in the emergency department to remind families and carers to include their contact details on the patient’s admission form. The JH&FMHN is developing a talent management strategy to improve the access, allocation and appropriateness of learning opportunities for its staff. This project implemented a guideline in the emergency department to help staff manage patients with chronic anaemia due to iron deficiency. The steps in the perioperative pathway were reviewed and a number of interventions trialled to maintain the temperature of patients prior to, during and following surgery. CCLHD designed a new anaesthesia form, produced educational posters for staff and developed a dental package that encouraged anaesthetists to document the dental state of patients prior to surgery. This project developed next-generation sequencing protocols and a bioinformatics platform for diagnosing mitochondrial disease, as well as a diagnostic pipeline that improved the speed and accuracy of diagnosis. Prince of Wales Hospital developed a communication pathway that reported incidental findings, unexpected findings and changes to provisional medical imaging reports back to the referring clinician within an agreed timeframe. This project identified and examined the systemic issues leading to the use of seclusion at The Children’s Hospital at Westmead. It implemented preventative strategies to reduce the use of seclusion, including multidisciplinary team care plans, staff education, daily intake and handover meetings, as well as supervision sessions for nursing and allied health staff. CCLHD implemented a number of pre-warming strategies, to reduce the incidence of inadvertent hypothermia in surgical patients. The Hunter Brain Injury Service developed a new process for completing community access, upper limb and activities of daily living (ADL) assessments, using a transdisciplinary rehabilitation approach. The Forensic Hospital made changes to its treatment and management plan, introduced the NSW Mental Health Care Plan and conducted staff and patient education on the value of developing a care plan in collaboration with consumers. JH&FMHN developed a streamlined chronic disease process that addressed the barriers to completing a multidisciplinary care plan, by engaging frontline clinicians. Liverpool Hospital implemented a sustainable process for monitoring, management and early escalation of long stay patients. The goal was to provide a structure for helping clinical teams develop appropriate and high-quality patient management plans. 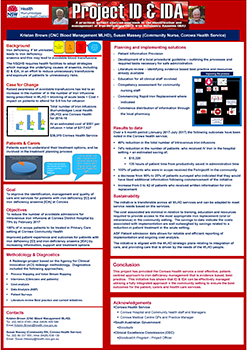 This project examined the sequence of events from arrival to the ward and transfer of patients admitted to an inpatient ward through the emergency department, to identify improvements that would reduce the number of admitted patients with an ED length of stay of more than four hours. This project identifies gaps between the skills that new graduate and Level 1 physiotherapists have gained via study and the skills required to work within the physiotherapy department of Broken Hill Health Service. This gap analysis will allow individual professional development pathways to be developed for physiotherapists, to maintain a high quality of service within the physiotherapy department. This project implemented training and staff communication to improve the accuracy and amount of data collected in the electronic patient record, with a focus on pathology International Classification of Diseases (ICD) code, disease stage, tumour laterality, date of diagnosis, performance status and acute radiation toxicity. This project developed a new model of care to allow children with standard or medium risk acute lymphoblastic leukemia, who have received high dose methotrexate, to be discharged within two days instead of five. This program will provide better and more appropriate clinical care to the dying patient and their family, through improved education, End of Life Care policies, referral pathways, nursing resources and the use of volunteers as support for carers. This project examined the issue of coronial autopsy tissue retention and implemented policies and practices that reduced the amount of tissue retained and the proportion of autopsy cases where tissue was retained, without decreasing the quality of service provided. The Gosford Surgical Admissions Centre (GSAC) is a short stay surgical admissions centre providing care to 1350 elective patients per month. The project aim is to improve the patient satisfaction rate by focusing on communication, the waiting room environment, the admission processes and streamline documentation.